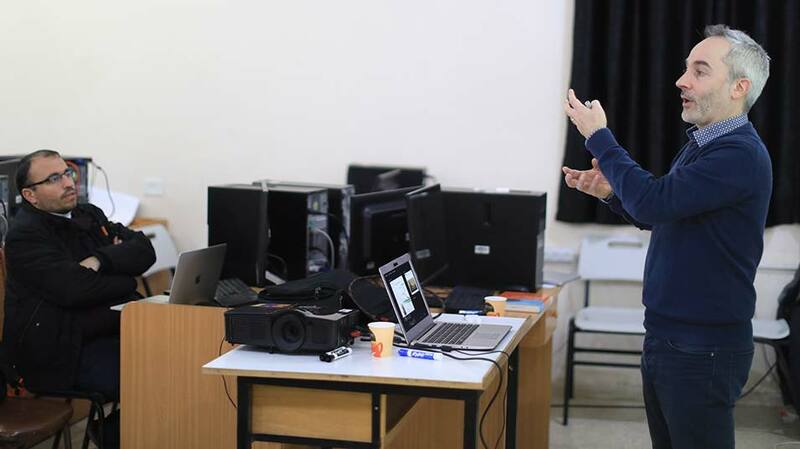 In the framework of Quality Improvement Fund (QIF) project, the Department of Mechanical and Mechatronics Engineering at the Faculty of Engineering and Technology held a Training of Trainers course on Simulink Real-Time software; a program that creates real-time systems for desktop, lab and field environments. The Course comes as part of a larger project that aims at enhancing the competencies and qualifications of engineering graduates through building up networks and ties with the industrial and private sectors. The Trainer of Trainers was conducted by Professor Dr. Christophe Collette and Dr. Guoying Zhao from the Université Libre de Bruxelles in Belgium. The hands-on 30-hour workshop focused on training instructors to be providing capacity-building assistance to students and graduates on using Simulink Real-Time software. The software will enable graduates to convert desktop-based simulation applications into real-time applications that run on the target machine and interface with physical hardware. At the end of the training, certificates of participation were handed to the trainers by the Dean of the Faculty of Engineering and Technology Dr. Wasel Ghanem and Project director professor Dr. Afif Hassan.